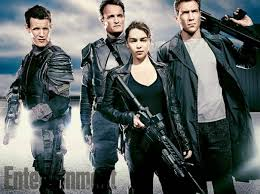 There has been a huge push for "Terminator: Genisys" in terms of marketing. We saw some big photos of the film a few weeks back and today the trailer premiered. It seems Paramount Pictures has a lot of faith in this adaptation and it seems they are truly confident that this film will jumpstart a brand new franchise. I am still on the fence. While there is some cool stuff in the trailer, this is the third attempt to create a new franchise out this idea, and the two previous attempts failed miserably. Plus, there is a whole lot that is grabbing me and asking me to please see this. The scene where Emilia Clarke's Sarah Connor rescues Jai Courtney's Kyle Reese from a terminator and saying "come with me if you want to live" was laughably bad. The scene in which present-day Arnold Schwarzenegger kills the 1984 computer generated, young Arnold Schwarzenegger was haltingly bad. (What is it with computer-generated Arnold's?) In this one introduction trailer, I have seen more troubling footage than stuff that will reel me into the theater, moreso than the "T3" trailer and the "Terminator: Salvation" trailer. I hope a second look later on will change that, as of right now, I have a bad feeling about this one. On the plus side, it feels good to see the real Arnold Schwarzenegger back in this franchise, but will this come to anything without James Cameron at the helm? Am I wrong? See for yourself.